Investment by new digital services like Spotify, Sky, Amazon, Apple Music and Google has resulted in sales of music, video and games running £1bn ahead of where they were just four years ago, according to data compiled by the Entertainment Retailers Association (ERA). Preliminary figures indicate that booming digital services helped the music, video and games markets achieve new all-time record sales of £6.3bn in 2016, up 3% on the previous year – and over £1bn more than they were as recently as 2012. That 3% growth is even more remarkable since it comes in comparison with 2015, which was a 53-week year. For the first time in 2016 the video market became a majority (58%) digital business with revenues from downloads and subscription services now exceeding those of DVD and Blu-ray discs. Digital services account for 57% of music revenues and 74% of the games market. Data are compiled from Official Charts Company, GfK and IHS. Physical formats of music, video and games product declined by 15% in aggregate in 2016, but some physical formats continue to flourish. Sales of handheld games software grew 21.3% to £48.8m, while vinyl records continued their sustained revival, up 56.4% to £65.6m. Indeed, vinyl album sales outstripped digital downloads for the first time in the first week of December. ERA says that £2.4m was spent on vinyl albums in week 48 of 2016, while only %pound;2.1m was spent on digital downloads. It marks a huge swing from the same week in 2015, when the £1.2m spent on vinyl albums was eclipsed by £4.4m of digital downloads. Vinyl sales is reported to have grown for the eight year on the trot with over 2 million LPs sold in the UK, the highest figure since 1994. Also, a new BPI report revealed that YouTube and other streaming sites paid out a “meagre” £24.4m to British artists, despite music video streams growing 88% to nearly 27billion last year. Meanwhile, vinyl sales accounted for £25.1m. Total revenues generated by British music were worth £688m. Digital video revenues from the likes of Netflix, Sky, Amazon and Apple reached £1,309.3m in 2016, up an incredible 22.8%. In contrast physical revenues were down 16.9% to £893.6m with both DVD and Blu-ray suffering double-digit declines. The biggest-selling video of the year was Star Wars: The Force Awakens with sales of 2.3m units. Music revenues grew by 4.6% in 2016, well ahead of video (up 2.2%) and games (up 2.9%) powered by a huge 65% rise in music subscription revenues driven by services such as Spotify, Apple Music, Amazon and Deezer. The biggest decline was suffered by downloads (down 26.8% overall). After a relatively resilient 2015 when sales declined just 3.7%, CD revenues fell by 13% in 2016. The biggest-selling album of the year was Now That’s What I Call Music 95 with sales of 908,500 units. 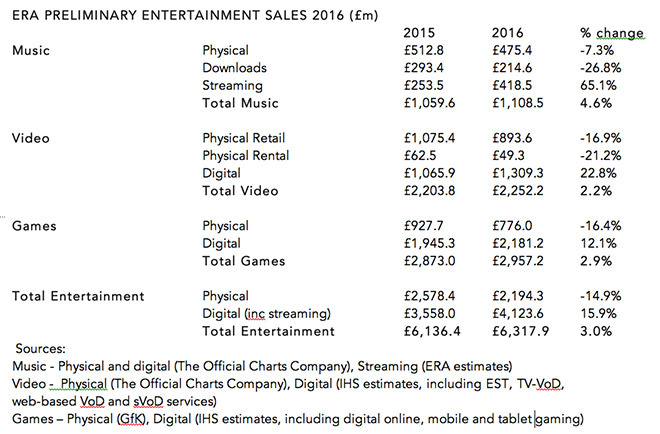 Games revenues grew by a relatively modest £84m in 2016 (up £256m in 2015). Physical games sales declined 16.4% to £776m, while digital revenues grew 12.1% to reach £2.1bn. Positive news for physical came with a 21.3% increase in sales of handheld games. The biggest-selling game of the year was perennial hit FIFA 17, which with sales of 2.5m sold almost exactly the same number of units as its predecessor FIFA 16.